Williams Gate Works is a professional builder of wood gates, which we custom design for entry to your yard, patio, driveway, garden, back yard, or side entrance. We also specialize in carriage style garage doors and hinged doors which we can construct with clear redwood, western red cedar, mahogany, and reclaimed old growth redwood. Our gates are an attractive addition to your driveway, garden, backyard, or side entrance. At Williams Gate Works we have been in the business of crafting beautiful, unique entrances for clients in Hillsborough for over 25 years. Why settle for ordinary, when you can have an extraordinary custom redwood gate or garage doors that set your property apart from the rest? We cater to both residential and commercial clients in need of customized solutions, whether you are in search of custom side gates, a wooden gate for the driveway, or are looking for an access solution for your backyard or garden. Residents know that often it is those smaller elements that set their homes apart from the rest. Our custom garage doors make a dramatic difference in your home, and are of exceptional quality. For business owners looking for solutions to make an area more secure or increase curb appeal, our solid wood gates are designed to stand up to the elements. We fabricate them using special design elements like mitered corners, weep tubes, old world joinery combined with state of the art marine epoxy adhesive, to give you the strongest, most durable, longest lasting gate made. 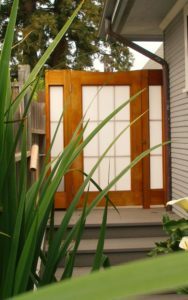 Custom gates handmade from beautiful redwood are a smart investment in your home or business, and far more aesthetically appealing than those made of metal which often rusts. Considering most people buy entrance gates for a backyard or side entrance at the home supply store, you can imagine how common they are. Set your property apart from the rest with our exquisite custom wood gates and carriage style garage doors. Residential and commercial customers in Hillsborough will find our products to be not only beautifully detailed and unparalleled in terms of quality, but functional and durable as well. Quality meant to last is what sets us apart from others; never settle for less. Serving Hillsborough and the California Coast including Carmel Ca.